It’s the poor cousin to almost every other issue in rural Vietnamese education. 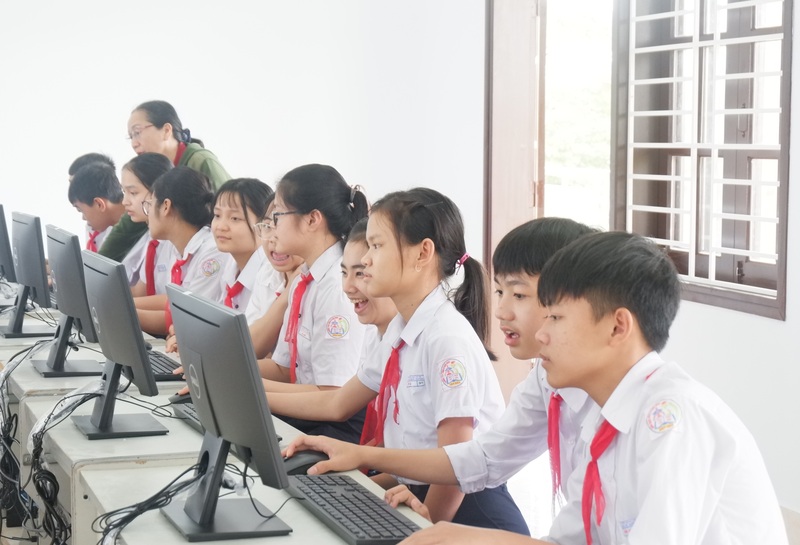 On November 30th, Lifestart Foundation, an NGO that operates in central Vietnam, donated 28 computers to Dung Si Dien Ngoc Secondary School and Tran Cao Van Secondary School, both in Dien Ban Town in Quang Nam Province, using a 25,000-dollar grant provided by the New Zealand Embassy in Hanoi. A teacher and students try out their new computer room at Dung Si Den Ngoc Secondary School in Dien Ban Town, Quang Nam Province. Leonard went on to say, “Students in the countryside usually come from poor families – rice farmers mostly. They do not have access to technology like their counterparts in the cities. IT skill and knowledge is a necessary and vital part of learning and will enable them to compete on an equal playing field. The donation does not include training. The schools have an IT teacher albeit under-resourced. So what did I mean by ‘poor cousin to every other issue’ at the top of the article? Live in the bigger cities with a reasonable income and it’s likely that the better funded schools would have computers. We all know that – yet rural education is plagued by other considerations such as safe ways to get to schools (bridges), schools in the mountains that don’t even have brick walls or enough funding for the basics of school materials and so on. Computers would be very far down the list of what’s needed now. 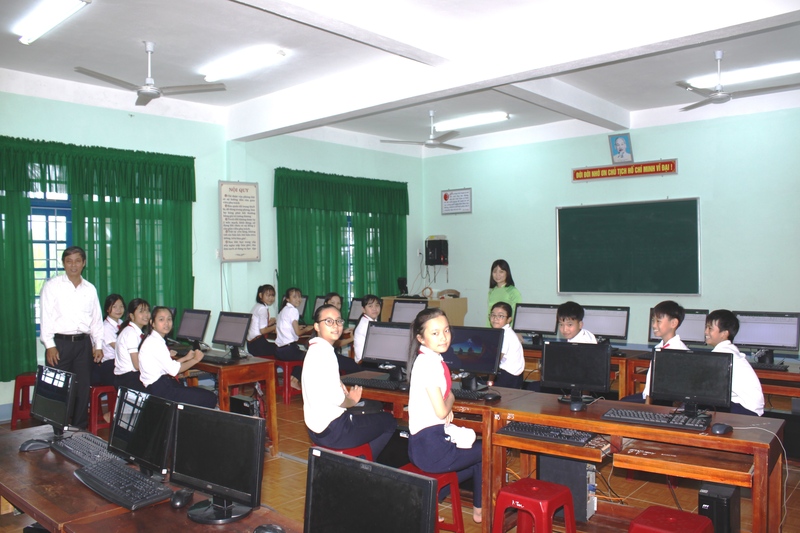 Students and staff at Tran Cao Van Secondary School Dien Ban are very happy with their new computer room. I don’t mean this as a criticism of Lifestart’s good work. I also don’t mean this as a reflection on local efforts to improve conditions in educational situations. Yet it is an important part of the nation’s need to develop a workforce that can take advantage of the opportunities and vast changes coming to Vietnam as it modernizes its economy. There are a number of things I can point out. A cheap labor force is attractive for some businesses that involve a lot of manual handling such as shoes and clothes manufacturing but already many of these businesses will automate a large part of this work within the next decade, leaving staff out of a job unless they can retrain – and some awareness of computing will give staff the opportunity in seeking work. Another trend is Vietnam’s expanding use of online services for government administration, both to the public and in-house. Again, computer training plays a big part in this. Giving rural students more access to this will hopefully narrow the skill gap between urban and rural competitors for work and just as importantly, higher education. 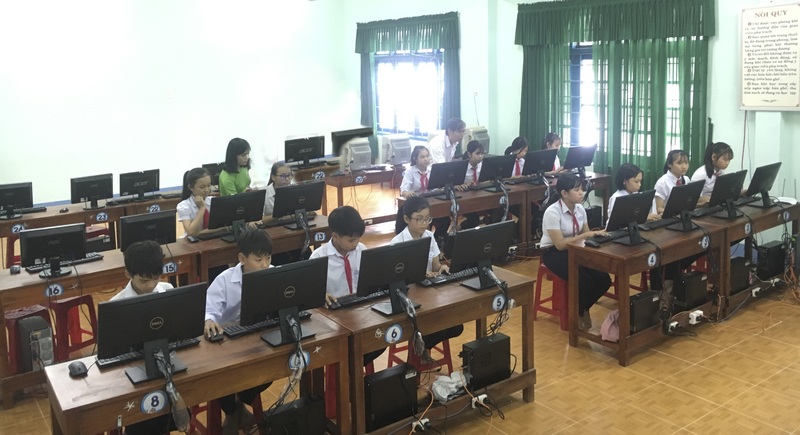 Students and teachers use donated computers at Tran Cao Van Secondary School in Dien Ban Town, Quang Nam Province. For rural students, scholarships to enter university are just the tip of the iceberg. In Da Nang, for example, almost every higher learning institution posts admission applications, courses, homework, administrative procedures and much more online these days. And all that goes back to the beginning; learning to use computers in school. It has now become almost the necessity (not the luxury) of getting a computer for home or a laptop for study. So the idea of “it’s a ‘luxury item’” is not really that accurate these days. There are other issues of course, particularly training and support for IT teachers outside the urban environment. Another is the ongoing costs of Internet connection and technical support. One interesting innovation is online classes with advanced teachers shared with poorer schools via the net. It’s one way of reducing costs and giving wider access to knowledge across the nation. This, of course, is out of our hands, it’s up to the national government to consider greater investments in education. Anyway, congratulations to the kids of the schools and Lifestart Foundation for such a project and here’s hoping that they all get into higher education!